Here’s a legislative alert from our friends at Conservation Voters New Mexico! SB421, a bill that would strip local communities of the right to protect significant cultural properties, is scheduled to be heard today (March 4) in the Senate Judiciary Committee, which convenes at 2:30 or whenever the Senate floor session ends. The bill is sponsored by Sen. Rod Adair, (R-Roswell). The bills are important because they would drastically reduce the power of local communities and residents to protect significant cultural properties by forcing them to register them with the State. If passed, either of these bills would undercut the work of the Cultural Properties Review Committee and be a significant change from established process for nomination of future sites to the New Mexico State Register of Cultural Properties. The bills would require that nominations to the New Mexico State Register of Cultural Properties include written notice of support from the majority of property owners, including those holding subsurface mineral interests. This standard of owner support exceeds that required for nominating properties to the National Register of Historic Places – and would put extractive companies in the firmly in the driver’s seat. If you care about this, contact Adair by clicking here or Vigil by clicking here and here. UPDATE: The Senate bill has been tabled; but the companion bill lives on in the House. Read more here at Democracy for New Mexico. 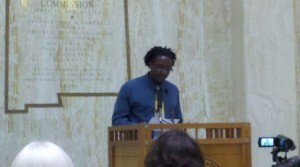 Poet Hakim Bellamy performing in the Capitol Rotunda on Anti Racism Day. Photo by Claus Whiteacre. The most important piece of health legislation in this year’s session might just be one without the words Medicaid, health insurance, or the names of any disease conditions in it. Instead, it is a bill addressing institutional racism, the practices and policies within institutions (e.g schools, courts, hospitals, businesses) that lead to unequal access to resources based on skin color. 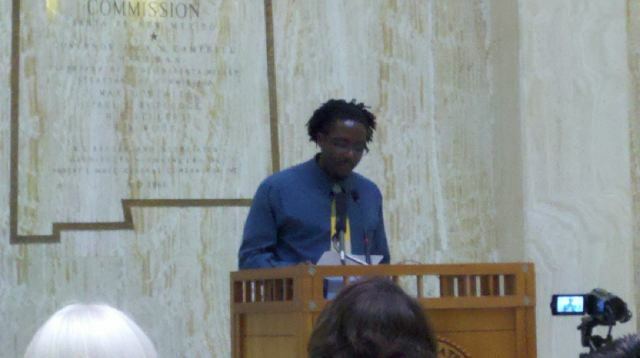 A week ago, the health professionals, educators, and community activists of the New Mexico Health Equity Working Group (NMHEWG) rallied for the bill at the first-ever “Anti Racism Day” at the legislature. House Joint Memorial 32, sponsored by Rep. Antonio “Moe” Maestas (D-Albuquerque) and Sen. Tim Keller (D-Albuquerque) passed its first test, being approved by the House Labor Committee at 8pm on Thursday, February 17th. Many of the professionals seated at the front, all running for the upcoming Albuquerque Public Schools (APS) school board election on February 1st, appeared unprepared for such a question. This was the energy on the Dr. Martin Luther King Jr. holiday when over one-hundred people gathered at University of New Mexico’s Law School for the “Teach-in and Candidates Forum” hosted by the Critical Race Theory (CRT) Working Group. Youth from local high schools, UNM students, staff, and faculty and community members gathered to enhance their understanding of racism and CRT, and then to use the “teach-in” to inform a school board candidates forum. 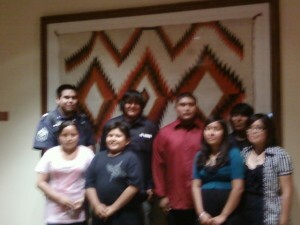 The program will be broadcast on KUNM’s Youth radio this Sunday from 7-8pm. And why wouldn’t she let everyone know? The third-term congresswoman from the 8th District of Arizona flew back from D.C. nearly every weekend and was proud of her strong record of constituent service. Colleagues say the 40-year-old Congresswoman was driven by noblest aspects of the American democratic ideal. But what happened instead of “Congress on Your Corner” last Saturday was an American nightmare. 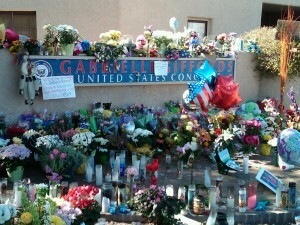 In a premeditated attack, a madman shot Giffords in the head and fired on the crowd. A congressional staffer who worked for Giffords was killed, along with a child, a federal judge, and three senior citizens, all of whom were exercising their democratic right to talk to their congresswoman. Fourteen others, including Gifford, remain seriously or gravely wounded. This was an assassination of democracy, an armed assault on citizens gathered to exercise the most precious of American rights—the right to free speech and assembly. Rep. Giffords was doing the essential work of politics, meeting with her neighbors and constituents outside of a grocery store in a “Congress on Your Corner” gathering. This small “d” democratic act is so central to our Constitution and our republic that its protection is enshrined in the First Amendment, the same amendment that Giffords read aloud on the opening day of Congress. Nothing is more corrosive to democracy than the use of violence to terrorize the public square, to shut down speech, to slay those seeking its exercise. If you missed Tuesday’s town hall in Albuquerque with Federal Communications Commission chairman Michael Copps on the Future of the Internet, you can catch up right here with these links. The event was sponsored by the organizations The Center for Media Justice, Media Literacy Project and Free Press. Federal Communications Commissioner Michael Copps spoke to hundreds of supporters about the need for net neutrality Tuesday evening at the Albuquerque Journal Theater at the National Hispanic Cultural Center. Net neutrality is the principle that all content on the internet should be treated equally, and that internet service providers cannot discriminate between different types of content. “When broadcast came about the corporation said ‘trust us.’ When previous FCC commissions removed limits on media consolidation we were told ‘trust us.’ With this new medium they are saying ‘trust us,'” Copps said. Andrea Quijada, the Executive Director of the Media Literacy Project, served as the MC for the evening. She shared how an open internet is needed for the most basic of services. “America cannot have a digital divide, this is an injustice for those that have been too long denied,” Copps said in his speech. Perspectives from the community included single mothers explaining how the internet allows them to provide a strong sense of family; students detailing how far they have to drive just to finish nightly assignments; local artists and slam poets offering a cultural perspective; professionals trying to bring the online world to offline communities. The point was clear- we need an open internet, we deserve an open internet, and now we demand an open internet. Finally, those who would like to see an accounting of the entire event can visit this link to the webcast at SaveTheInternet.com. “Expel” isn’t a word we hear often in these United States. For people like me who love words and appreciate their every connotation, “expel” brings to mind vermin or trash – something so vile that it must be hurled violently away. SANTA ANA PUEBLO, NM – A week before the school year began, a group of American Indian youth in New Mexico were not only working hard, they were teaching the class! Earlier this month, the 39th annual conference of the Association of American Indian Physicians (AAIP) featured nationally known speakers, including Dr. Yvette Roubideaux, the current director of Indian Health Services. Alongside such speakers were three groups of local youth presenting on their efforts to create healthier, more sustainable and empowered communities. The exciting new website aims to use digital media to evoke the deep cultural traditions of New Mexico communities as well as the rich legacy of struggle through alternative media for justice, equity, and opportunity that exists in New Mexico. In English, El Grito means “The Cry,” and in this context it refers to several things, including the traditional shouts made during cultural celebrations and dances in New Mexico, as well as to El Grito de Dolores, the battle cry of the Mexican revolution for independence from Spain. El Grito also refers to El Grito del Norte, a community newspaper founded in Espanola in 1968 that chronicled the grassroots struggles of traditional New Mexico communities. 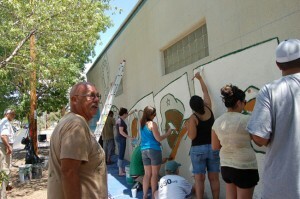 Writers and activists from El Grito del Norte later moved to Albuquerque’s Los Duranes neighborhood, where they founded the Chicano Communication Center to advance grassroots communication across the state. SWOP’s roots in alternative media extend back to those days at the Center, and the spirit of grassroots powered media lives on in our work today through blogging and our magazine, Voces Unidas. We hope that spirit is embodied here at El Grito, where we’ll bring community based analysis about the burning issues we face today, as well as news of the happenings in our communities. In an interesting nod to history, two of El Grito’s writers, George Lujan and Clearly New Mexico alum Juan Reynosa, are from families that were well represented in the Chicano Communication Center. The site will have several sections, including space for community event notices and for short pieces on current events El Grito finds noteworthy. There will also be longer articles from El Grito writers. Submissions from the public are encouraged and welcome. Our lens is critical analysis of our society, our focus is the landscape experienced by New Mexico’s traditional and low-income communities. We reserve the right to only publish those pieces that further the debate in a constructive and positive manner. El Grito is strictly non-partisan, and will not publish any content referring to political elections or written by a person seeking elective office. We pledge to offer a space here for the diversity of voices that exist in New Mexico, and to continually seek out and share the stories and views of New Mexicans who may not always have access to a medium that will let their cry be heard across the state. And we sincerely hope you’ll check in often and add your “grito” to the debate. Please join Clearly in welcoming this much-needed voice to the New Mexico blogosphere! 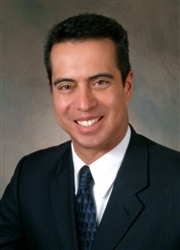 Rep. Antonio “Moe” Maestas of Albuquerque was already outraged about the state of Arizona’s decision to pass a law requiring state and local law enforcement officers to ask for identification from people they believe are in the country illegally. Maestas, an Albuquerque attorney, and many others believe the law gives police the right to stop and harass anyone they choose, based only on the color of their skin. But news that Arizona has now banned ethnic studies in public schools as well has convinced Maestas that Arizona Governor Jan Brewer and her supporters are finally showing their true colors. “They’re all really showing their hand as to what the real issue is,” said the two-term Democratic representative from the city’s West Side. Maestas said he believes the law passed in Arizona because so many Arizonans are “culturally disconnected “from Arizona’s demographics. Arizona’s population includes a high number of Anglos who have moved there from somewhere else, have never encountered Hispanics and feel innately uncomfortable around them, he said. “They have formed their own demographic reality,” Maestas said. In contrast, New Mexico’s history includes the long and established presence of Hispanics who own land and vote – which translates into political power for Hispanics in New Mexico. “Nuevo Mexicanos are a different breed – They own land and they vote, unlike a lot of Latinos elsewhere in the country,” Maestas said. According to the National Association of Latino Elected and Appointed Officials, New Mexico’s legislature is 44 percent Hispanic, a contrast to 16 percent in Arizona. New Mexico has the highest percentage of Hispanics of any state — 45 percent, compared with 30 percent in Arizona. Historically, immigration has been a wedge issue for Hispanics, many of whom are socially conservative and favor strong government action to limit illegal immigration.